Living far from the equator can be a bit of a bummer – we miss out on that awesome high concentration of sunshine and long sunny days. Instead we crawl sadly into our damp Dunedin caves at 4pm when we lose the sun in winter. We brave the cold Antarctic winds and surf in what feels like a frozen margarita all year around, never daring to risk a shorty wetsuit, even in summer. The upside to all of this? We are one of the very few places on Earth that gets treated to the aurora! Aurora Australis, also known as the Southern Lights, translates to “dawn of the south” (while our neighbours to the north call it Aurora Borealis, the “dawn of the north”) and it is the most spectacular display of atmospheric chemistry mankind can bear witness to. Earth’s atmosphere is a smorgasbord of gases – mainly nitrogen and oxygen with a casual clustering of helium, hydrogen and some other random stuff. Surrounding our planet is a geomagnetic field, which protects us and our ozone layer from the cosmic rays, and their dastardly mates the charged particles of solar winds. This magnetic field is pretty much due to our molten iron innards, which is essentially Earth’s ‘magnet’ – the magnetic field propagates from this core out into space and back in through the poles. The magnetic field is full of electrons and positive ions, which means that it is always ready to party. And party it does! The Sun also has an atmosphere and a magnetic field, mainly because it’s a smug story-topper, but also probably because it’s a huge guy in space. The sun exists in a plasma state, and its atmosphere is composed of hydrogen, containing ions (charged particles) and electrons, which exist in such a high energy state that they just shoot off into space, escaping the Sun’s gravity. This is what we refer to as “solar wind”. The solar wind is always acting a damn fool and harassing Earth’s magnetic field, causing the magnetic field’s shape to change, resulting in a compressed field around the Earth, known as the magnetosphere. 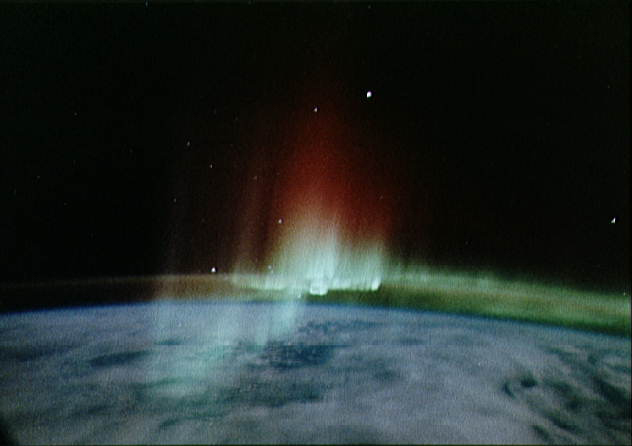 The magnetosphere is full of built-up energy from the solar winds, and this is the power that drives the auroras. When pressure from the solar winds builds up in the magnetosphere, an electric voltage is created, which runs from the magnetosphere to the poles, reaching up to 10,000 volts. Exacerbated by solar storms, this accelerates electrons to the poles and forces them down into the ionosphere (the upper layer of our atmosphere). Remember how our atmosphere is full of gases? Now that these speeding electrons are all up in our atmosphere, they begin smashing into those gases, feeding the gas atoms energy, which results in them emitting photons (light) and more electrons. You could say that the gases in the ionosphere act as conductors for electric currents in and out of the poles. The light emitted as photons from the smashing of electrons and atoms are what we see as the auroras, and the colours are indicative of where in the atmosphere the electrons are interacting with the gas, and which gas is involved. Oxygen gives off a greenish yellow colour or a red (depending on how high up the interaction is), while nitrogen gives off a blue tint. These colours all mix together, which is how those vivid purples and pinks appear. If you’re keen to cast your juicy orbs on an aurora, the best places in Dunedin to check it out are Hooper’s Inlet and Blackhead Quarry. Dunedin Aurora Hunters is a group on Facebook that shares information and advises when auroras will be visible – so take a blanket, turn off all light sources and delight in the cosmic beauty afforded to us – because we are truly lucky to be able to see it. This article was originally published by Critic te Arohi, the University of Otago’s student magazine. Artwork is by the wonderful Ceridwyn Giddens – check out her work here!